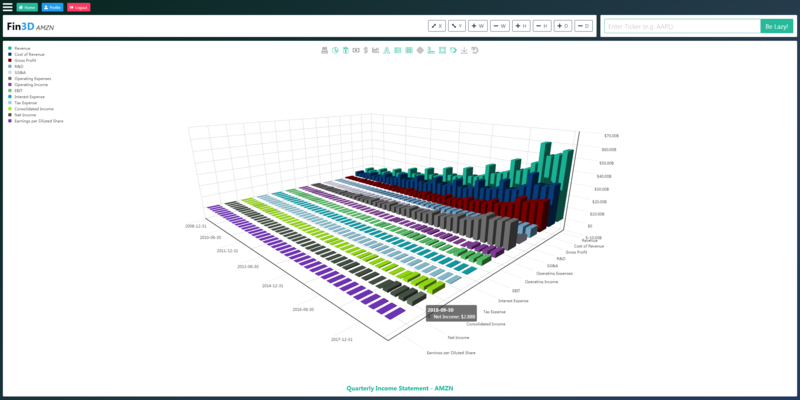 I took 10 years of quarterly income statement data from the major FAANG companies and used EchartsJS to visualize it in 3D. I had a lot of fun learning this charting tool and it’s pretty interesting to see the relationships between all these items in three dimensions. For example, it’s very easy to see the cyclical nature of AAPL in their revenues and costs, and also very easy to see the cost of revenue/revenue relationship differences between GOOGL and FB which don’t have a ton of overhead, vs the same relationships for AMZN and NFLX which have very different margins. Anyway, take a look! If nothing else they’re cool to look at! Next up, multiple companies on the same chart I guess!